This journal is for the Summer Home Decor Challenge in the Moxie Fab World. Make some time to play along won’t you? I’m planning on making it part of a desk set for a partner I’m swapping with so she can keep it out as part of her summer decor. I started with a nice but too plain journal from Michaels. The cover had a purple binding, lilacs and yellow stripes with the scallops and cut outs and that’s it. 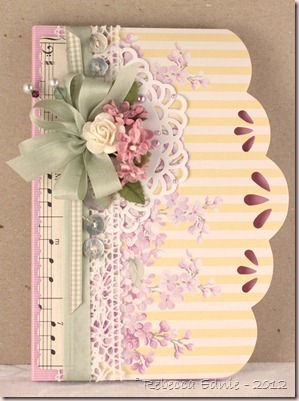 I added the music paper, lace, ribbons, flowers, pearls, doily, stick pins with beads and buttons. This also makes a great hostess gift; I took one with me last night when I was invited out since I made two! Previous postFriendship Canvas–My First Try at Mixed Media! This is lovely, Rebecca. I like how your doily echoes the cut-outs on the album, and the floral bouquet is VERY summery. Can't wait for the warmer weather.